So it has been a little while since I have posted anything on my blog, huh? The latter half of 2014 was an absolute whirlwind with work and things didn’t really die down until mid-December. Now I am on summer vacation, which is almost over, and it’s a horribly gloomy and humid day outside. What better than to stay inside and muck about with retro hardware? 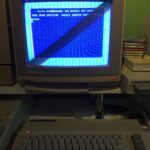 I never got into the Commodore 64 scene when I was younger, because I was fortunate enough to have access to the (clearly superior) Commodore Amiga. Having access to an Apple IIe in my early high school years did however show me the quaintness and simple joy of using 8-bit machines, and I always had a curiosity of the Commodore 64. 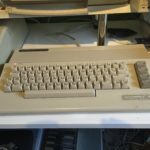 So when a Commodore C64C appeared on my eBay saved searches with a starting bid of AUD$89, I knew I had to at least put in a bid. EDIT: Thanks to Paul Rickards for pointing out that the images in this post were showing upside down for iOS Safari readers of my blog. I have stripped all EXIF data from my JPEGs, which has now rectified this issue. 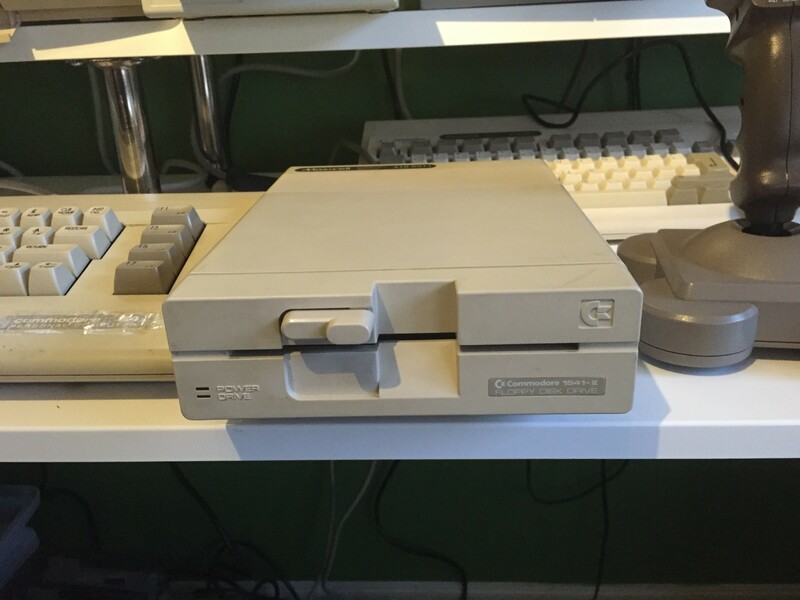 So I picked up this C64C with 1541-II 5¼” drive and some leads for $89. The item was located only a suburb away too, can’t get much better than that! For those like me who don’t know much about the history of Commodore 64s, the original C64 model (lovingly called ‘breadbins’ by enthusiasts nowadays) was released in January 1982 at CES, and was put on sale for $595 US ($1456 US in 2014 dollars). The ’64’ part of the name comes from the fact the machine came with 64KB of RAM installed. 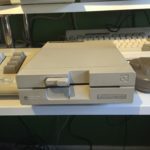 Software at the time was typically loaded up via cassette tape or cartridge, but soon after Commodore produced and sold disk drives (model number 1541), which were somewhat popular albeit unreliable. The C64C, released in 1986, was an updated model of the original Commodore 64, and was a cost reduced model that changed a few things — notably the case design, internal voltages and some chips were also updated. The 1541-II drive was also available at roughly the same time and had a similar case design to the C64C and Commodore 128. These C64 floppy drives were single-sided (the double-sided Commodore 1571 arrived with the Commodore 128 in 1985), so you got used to flipping your floppies pretty quickly. 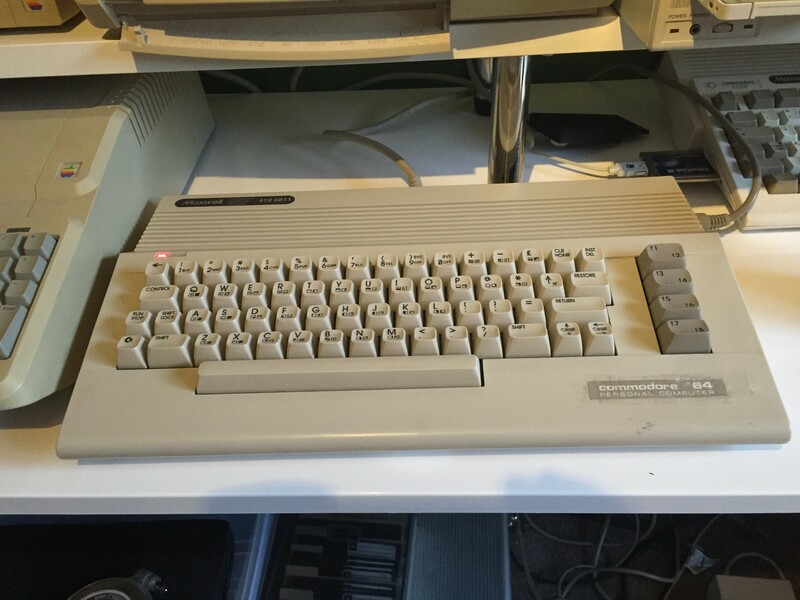 This C64C example was in pretty decent condition, given its age, and seems to have been well looked-after. When I received the unit, I had a quick look at the machine and saw a bit of grime here and there, but nothing show-stopping like roaches or mouse poop, which was a relief. So I drove home and had a proper look of what was included in the swag and unfortunately discovered that the 1541-II didn’t come with its power supply or data cable. Looks like I’ll have to source these from eBay over the coming months. 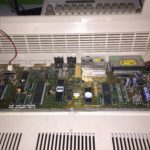 I didn’t check the machine before plugging the power pack and my spare Commodore 1084S monitor into the C64C, which is a big no-no, but powered it up anyway. 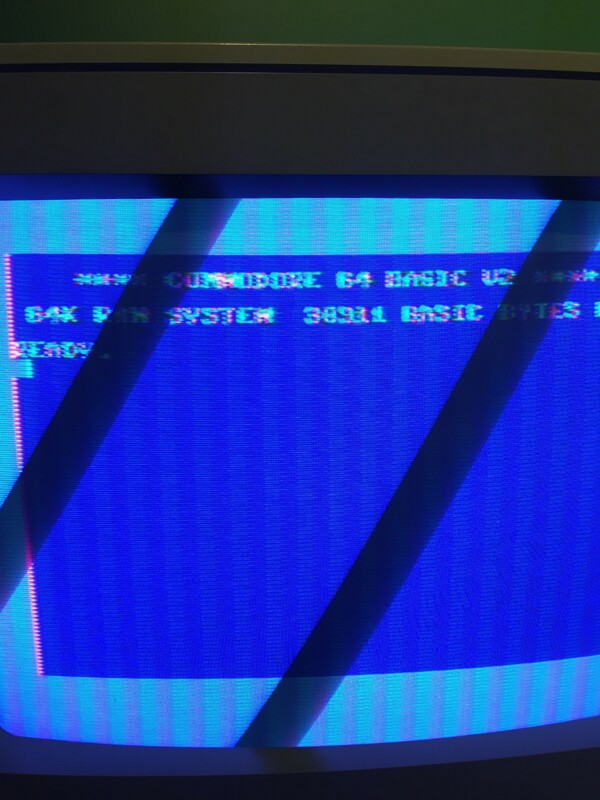 After a moment or so, the now-familiar Commodore BASIC screen appeared! She lives! Rear ports were a bit grimey. She lives! But she’s bleeding colour all over the place! The 1541-II that came in the auction. Unfortunately it was at this stage that I discovered that the colours on screen were bleeding heavily. 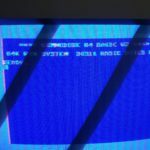 If you thought how the Apple II family handles colour on screen was bad, that’s nothing compared to my C64C. 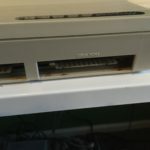 I was a little disappointed about this, but knowing how popular the C64 family is and how much information about the machine is available on the internet, I was sure that I would be able to find a way to fix it. Tuning the colour wheel on my 1084S to remove all colour produced a black-and-white screen (obviously), but without any bleeding at all, which I found interesting. Having said that, I have next to no experience troubleshooting and fixing monitors and CRT displays in general, so this will be a bit of a learning curve to fix. Close up of bleeding colour. Desaturating to black and white stopped the bleeding. 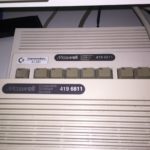 At that stage I wasn’t sure if the fault was with the C64C or my spare 1084S, so I connected the C64C to my (good) 1084S that I currently use with my Amiga 1200 and there was no bleeding at all. Clearly my spare 1084S has an issue with colour on the composite port at the back. 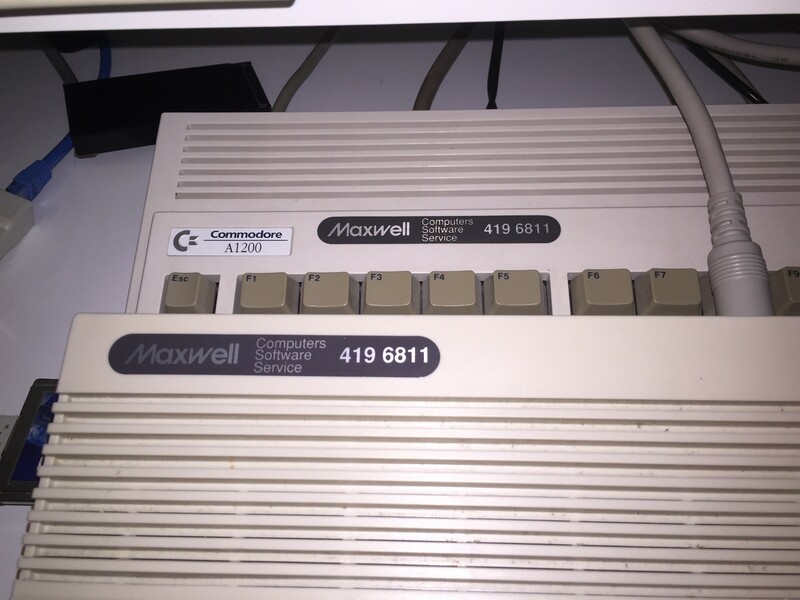 My spare 1084S only has a digital RGB and composite video signal input around the back, along with the audio channel inputs, so my options were limited on using alternatives for video with the C64C. 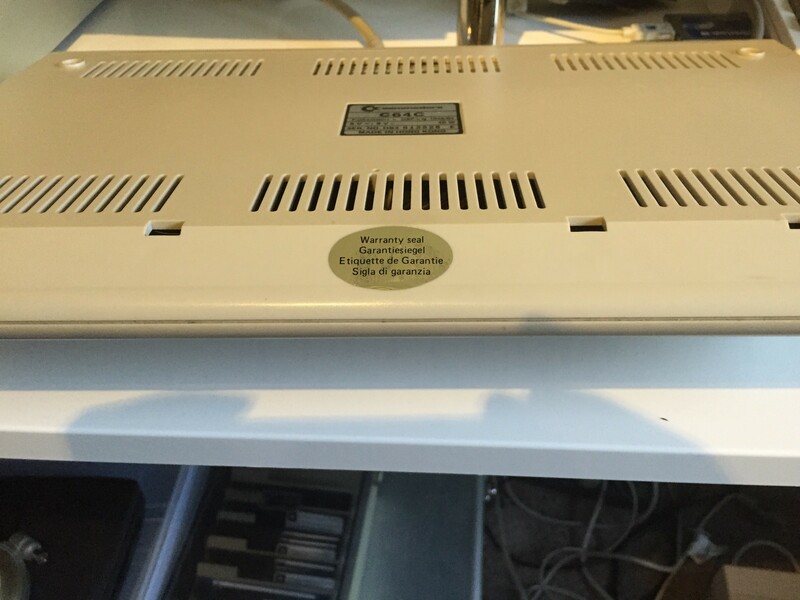 When I originally received this spare 1084S, I had plugged it to my Amiga 1200 and there were no video issues at all, so I am sure whatever is wrong with this 1084S, that it is isolated to the composite video input only. 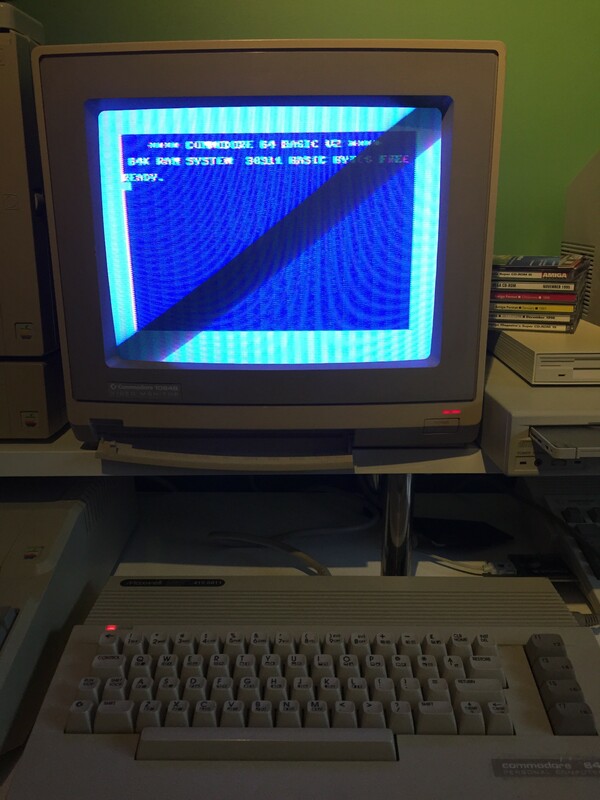 So the colour sucked, and I didn’t have enough hardware to use the floppy drive, so I can’t really do much with the C64C until I get more components to make things work. 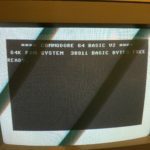 I found a one-line code snippet of CBM BASIC used to test the SID chip which created some bloops and bleeps through the monitor’s speakers, but the volume was quite low and turning up the volume wheel on the monitor made it a little louder, but also created loud humming — an issue I am sure is isolated to the monitor. 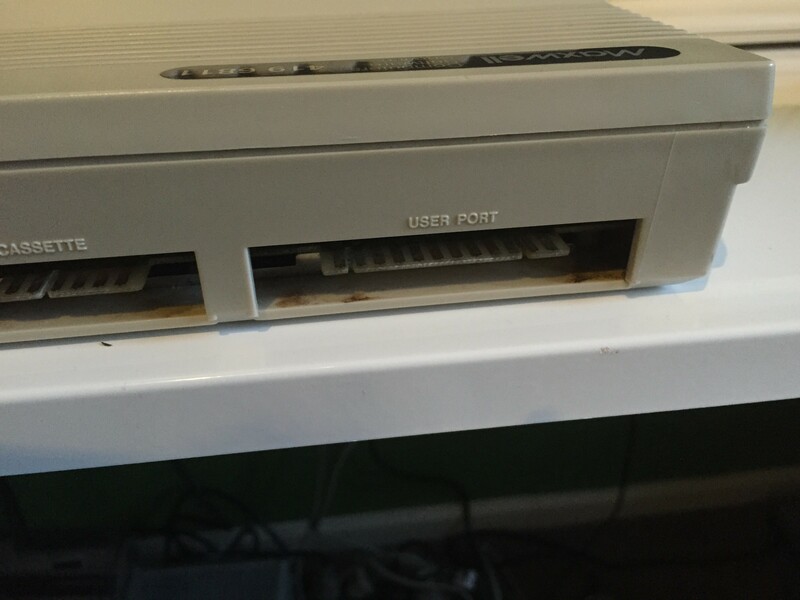 Is there a well-known volume issue with these C64Cs, does anyone know? I powered everything down and opened the machine up. 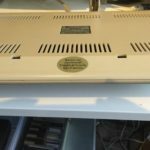 The warranty sticker was still intact on both the C64C and the 1541-II, so I had to break through the seal. I’m sure that’s OK, the machine is now 29 years old and the warranty period has probably expired by now :) Inside the machine was pretty dusty and the keyboard was a little crusty, so there’s an opportunity to pull that apart and clean it thoroughly. The layout inside is reminiscent of the A500 and A1200, so it was quite familiar to me. The board looks OK and I couldn’t see any swollen capacitors, which is good news. The case is pretty good, a little bit of grime around the power switch, but unfortunately the badge on the front has been sticky-taped and what looks like plastic cement or some other adhesive underneath. Not pretty. Removing keyboard and shield shows a healthy motherboard. 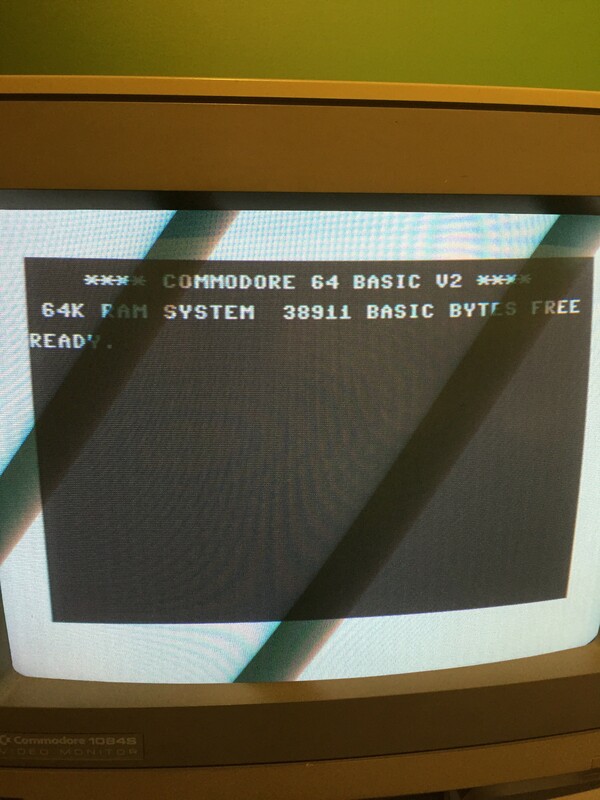 This C64C was serviced by the same guys who did my A1200. So what am I going to do with this machine? Not sure yet. Probably play some games on it. The joysticks I have with my Amiga 1200 are compatible with the C64 family, and are Competition Pros no less, which are a perfect match for the C64C. I must say though, space is a little limited now with the A1200 and related accessories, the Mac SE/30 and the Apple IIe Platinum. If I come across anything else interesting, I might have to pack one of these machines away. Definitely not the Amiga though! In the meantime, I have purchased an SD2IEC adapter and IEC Y-cable so that when I do get the 1541-II powered up and working, I can use it in conjunction with the SD2IEC at the same time. I am looking for a power supply for the 1541-II but at the time of writing, they seem to be very difficult to find in Australia. Naturally, the US has heaps of them on sale on eBay, but that doesn’t help me being in a 240V country. 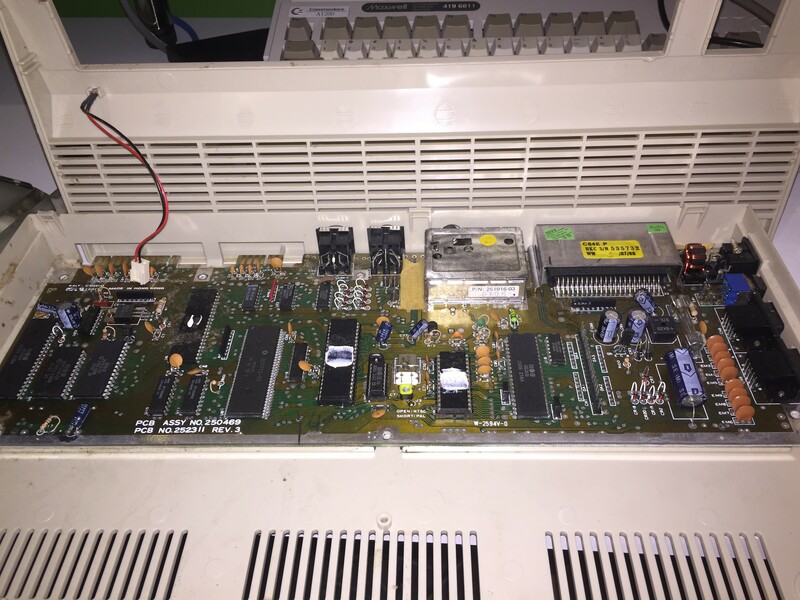 Twitter user Rajesh Singh informed me that there is someone called Ray Carlsen that makes PSUs for C64s and accessories, among other things, and a dual PSU that powers both the C64C and the 1541-II, while using only one power point, would be most ideal for me. I’m still researching and learning though. To be honest I am not sure if this machine will stick around as a permanent addition to my collection, but I’m sure using this little old C64 will be a blast and I am looking forward to sitting in front of that little 13″ CRT and waggling my joystick for hours on end.